Aquarius men are an exciting blend of mischief and deep thoughts. If you’re looking for mental stimulation, fun and sexiness in one package, then this is the boy for you. Unpredictable, broadminded and often a little "different" they are usually very intellectual and can be criticized as being cold or distant by those who are more emotionally inclined; while being appreciated by those looking for an independent partner. 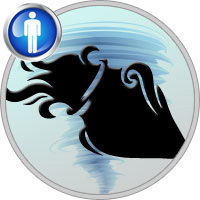 Aquarius men tend to come across as very self confident and independent in several ways. He’s unlikely to be interested in winning approval or compliments, making him often bold, non-conforming, and sometimes shocking. Many Aquarians are amused by narrow minded people, and aren’t beyond doing or saying things purely to see the reaction they get. They aren’t aggressive people per se, but they can be a little mischievous in this area. Since he’s probably not concerned as to what other people think of him, he often doesn’t bother forming opinions about other people’s behavior; a "live and let live" attitude may be evident. Along these lines he’s very unlikely to be into gossip, or to ever be petty. Aquarius men tend to be relatively detached at the start of a relationship. Partners often wonder if he is really interested in them at all. This works well with independent partners, but can cause a lot of confusion for those who prefer regular feedback. (If I had a dollar for every Scorpio lady who has emailed me regarding her Aquarius man ignoring her...). Aquarians are the scientists of the zodiac. They tend to question most things rather than just accepting them at face value, and have a healthy disregard for tradition and social expectations for their own sake. If something doesn’t make sense they are often the first to suggest changing it. Very often they have unique views which can make them fascinating (they also make some of the best astrologers). Aquarians can come across as detached, distant or even cold at times. This is partly because they often get distracted by their deep thoughts, and partly because they tend to to be "big picture" people rather than "people" people. Aquarius-Man and Aries-Woman - Both will understand one another’s need for freedom, and respect the other’s intelligence. Life for this pair will never be boring, but they may need to work a bit on staying grounded. Aquarius-Man and Taurus-Woman - The Taurus woman craves security and tradition, and she won’t likely find this with an Aquarius man. Both signs are very opinionated, so arguments may be numerous. On the other hand, the Water-bearer can add some excitement to Taurus’ life and the Bull can bring some order to the Water Bearer’s. Aquarius-Man and Gemini-Woman - They are very similar in personality. They share many of the same views. Each should fully understand the other’s need for adventure and respect one another’s cognitive powers. Since they also are both so free-spirited, commitment could be an issue for both. Aquarius-Man and Cancer-Woman - The Cancer woman may find Aquarius shallow and emotionally aloof, while the Water-bearer likely will hate the clingy nature of the Crab. These two will both need to move out of their comfort zones to make a true love connection. Aquarius-Man and Leo-Woman - Both love life and together they’ll have a busy social calendar. Unfortunately, the Lion is much more passionate about almost everything and will often consider Aquarius much too lukewarm. This will be a problem if they don’t learn to appreciate what makes one another tick. Aquarius-Man and Virgo-Woman - The Virgo woman is far too practical for the Aquarius man. Virgo will often see the Water-bearer as rash, unpredictable and illogical. And since neither sign is particularly affectionate or emotional, it will take some work on both parts to keep the spark alive. Aquarius-Man and Libra-Woman - Both are creative and intellectual, with strong social skills. A Libra woman might not get all the individual attention she craves from her Aquarius lover. But with time and her immense charm, she’s likely to completely win him over. Aquarius-Man and Scorpio-Woman - Aquarius may never provide the Scorpio woman with the security she thrives on, and she may see him as emotionally cold. But a Scorpion and a Water-bearer will often enjoy each other’s company as friends. To take their relationship to the next level she may need to readjust her expectations a bit. Aquarius-Man and Sagittarius-Woman - Both are adventurous, daring and fun-loving. Since each sign is also very independent, they’ll understand that need in a partner and will give each other plenty of space – just so long as they are careful not to give too much space. Aquarius-Man and Capricorn-Woman - The Capricorn woman is often much too practical for free-wheeling Aquarius, and the Water Bearer’s flirtatious manner won’t go over well with security-seeking Capricorn. There’s also a good chance that Aquarius will find Capricorn mundane and boring. Suffice to say, it will take some work for these opposites to attract. Aquarius-Man and Aquarius-Woman - Two Water-bearers can enjoy an exciting relationship together, filled with fun, adventure and great conversation. Neither partner will be too jealous or restrictive, so each will be allowed the freedom he or she needs. Of course, they also share similar weaknesses and won’t be able to rely on one another to make up for their shortcomings. Aquarius-Man and Pisces-Woman - They may seem too different to be compatible. Aquarius is ruled by intellect, while Pisces is ruled by emotion. Also, the Water-bearer’s innate need for freedom can make emotionally-dependent Pisces feel insecure. If they can get beyond their differences they could become the most interesting couple in their social circle.